The Heinz History Museum System consists of 4 museums, the Heinz History Center, Meadowcroft Rockshelter, Fort Pitt Museum and the Sports Museum. Each of these museums were running their own websites separate from each other which felt counterintuitive. To remedy this, the Heinz History Center wanted to bring all 4 museums for the Heinz History Museum System under one digital roof. One of the biggest challenges would be to find a way to let each museum keep their distinct personality but keep it easy for the museum staff to update and easy for visitors to find the information they needed. The client also wanted to increase engagement with museum goers by bringing the exhibits to life outside of the museum and also had a focus on making the websites mobile friendly so visitors could easily access parking information and hours on the go. A main museum system landing page was developed to create easy shortcuts to each museum and to information about the museum system as a whole. 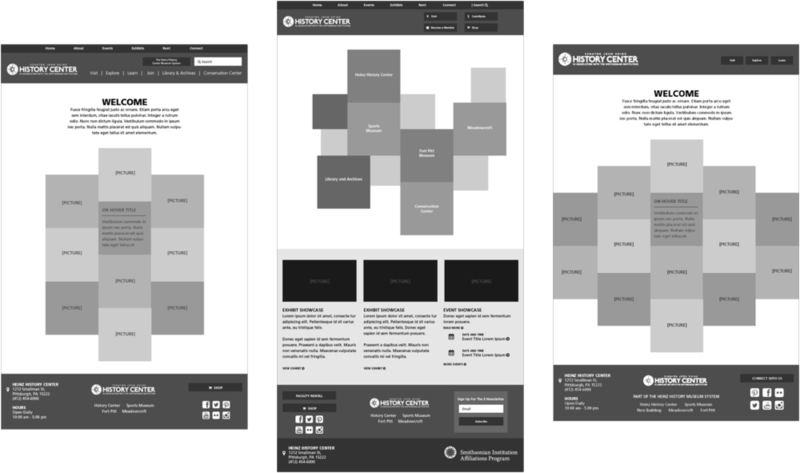 The wireframes above are a few of the early iterations before we arrived at the design we have today. One trip to the Heinz History Center will convince you that this museum is unlike any other, and moving into design it was important to highlight the quirky personality of the museum and distinguish it from the visitors preconceived notions of what a historys museum should be like. 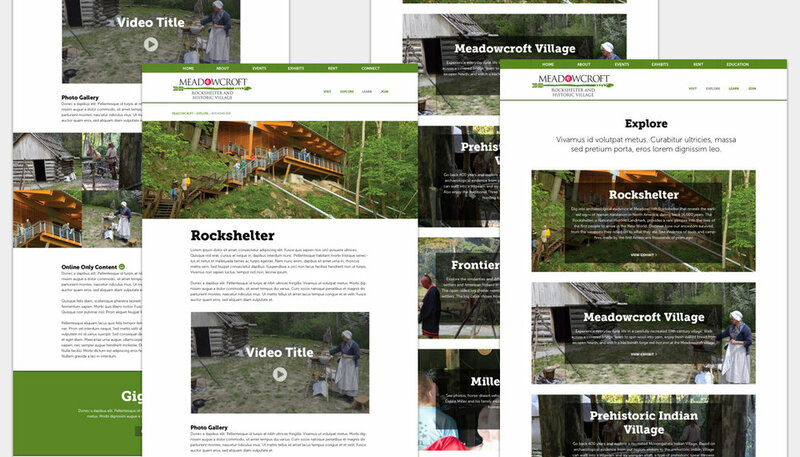 The clients really wanted the website to feel approachable and that you didn’t need to have a history degree or be on a field trip to have a great time so it was important to avoid any gray-brown tons and really embrace each museum's brand color. Several font options were presented before we settled on the Museo family. Museo Slab brought a great balance between feeling educational and feeling friendly. Type is featured prominently in all of the designs to be reminiscent of old newspaper headlines. It was important to the History Center that the new system helped promote and showcase each of the museums within the system. We developed flexible landing page templates for each museum that spoke to each individual personality while still staying within the new web brand.